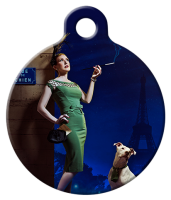 Read about some of our amazing past models and lifetime dog advocates! What you don’t realize when you first start to volunteer with Pinups for Pitbulls, Inc. is just how much it will change you from within, just how full it will make your heart and just how important it will be to your life in the future. You will acquire so much knowledge, so much purpose and so much love from Deirdre and everyone in PFPB. I wasn’t prepared to find this level of profound emotion and warm inclusion from the like-minded advocates in PFPB and it takes my breath away, every day, to feel this fortunate. It has been one of the top three most important and rewarding decisions in my life. If someone thinks that being a “pinup” representative somehow implies that we are not inherently brilliant or knowledgeable, that we don’t work insanely hard or that we have don’t have incredibly ground-breaking ideas and contributions, one couldn’t be more wrong. As an animal advocate, I absolutely admire and support other groups who are in the physical trenches of animal advocacy. I feel, however, that the education and advocacy angle that PFPB has chosen to represent, to be the path on which I’m immensely proud to be a part. I wanted to be at the root of the problem and at the place where the breedism and bias starts so that I could help to change the immediate perception of these uniquely beautiful animals. By filling out the Pinups for Pitbulls model application to be in a PFPB photo shoot with Celeste Giuliano Photography, you’re volunteering to be the face of change and to be someone who’s not afraid to tell the world that you support the fight against BSL. You’re showing everyone through your own photo representation of yourself and the pups that pit bull-type dogs are not only gorgeous, but that they are smart, unique, funny, confident, determined, loyal, loving individuals. 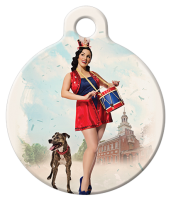 Being a part of Pinups for Pitbulls will feel…like you’ve finally come home. So go to https://pinupsforpitbulls.org/model/ and apply to be a visual, integral part of the change you want to see for pit bull-type dogs in the future. Even if you are not chosen for the calendar, just being a part of this group of strong, smart, pro-active, policy-changing, compassionate, national group of people will be the experience of a lifetime. Thank you for listening and for your support. Nancy Sue, Volunteer Coordinator, Ms. Feb 2014, Pinup of the Year 2014 with my dog, Brock. It is an honor and a privilege to be a Brand Ambassador for this magical organization and advocate for such a special group of dogs. We applied for the calendar 4 years in a row before being chosen, but each and every year I was motivated to become more involved, making me a better advocate. The whole process is an amazing experience and was such a wonderful way for me to celebrate my efforts as an advocate! Deirdre and her dream team made Marty and I feel like royalty, and the photo shoot with Celeste Giuliano was a dream come true! I encourage everyone to apply and don’t give up on the first try because it may take a several years… but it is totally worth it!! I found my pup, Marles Barkley, in a cardboard box next to a highway in Northern California. I had no experience with Pitbull-type dogs but knew he was coming home with me. I soon learned that with the companionship and snuggles also came discrimination in many forms. I met Deirdre (Little Darling) at a concert and, after hearing about Pinups for Pitbulls, knew that I belonged in this organization. Fighting BSL and having the opportunity to stand by other like-minded individuals and restore the positive image of the Pitbull-type dog (and all dogs) is such an honor. 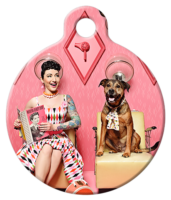 I have been an active volunteer for five years, and Marles Barkley and I had the fortune of representing Pinups for Pitbulls as Mr. and Miss February in the 2017 calendar. Receiving the phone call that we made the cut was one of the best days of my life, however, getting to represent this organization on a daily basis is even better. Wexist. This group of dog loving weirdos complete me! Being chosen for the calendar was just one piece of that puzzle. We are truly blessed! Three years ago today I nervously attended my very first Pinups for Pitbulls event not knowing that I had set the wheel of fate in motion. I had been following the organization for years but there hadn’t been an opportunity to get involved on the west coast. When I arrived I met our fearless team leader Michelle, Miss October 2015, of our brand new San Diego chapter as well as two totally rad n00bs Cody and Tabitha. We had fun, we met puppies, we talked to animal lovers, it was a GREAT day. Little did I know that I had met my future family that day. Fast forward to present day and I am so thankful that I showed up that day to the 2015 Del Mar Pet Expo. I learned so much about BSL and how we can all help fight to end this discrimination. Since then I’ve had opportunities to travel and talk to people in Tennessee, Nevada, Utah, and across California. I’ve learned valuable life lessons and gained confidence in the power of my own actions and words. I’ve built numerous friendships with people who inspire and motivate me to do more. Tabitha, for instance, has been with me since day one and has shared her kindness, dedication, support, and heart along the way. She has been a great partner and role model for me within the organization and in my personal life. It is an honor and only fitting that I follow her reign of Miss February 2018 as Miss March 2018. Fun fact… We even wore the same red shoes in our photos! You too can get involved and become a part of something bigger. Volunteer, donate, apply for the model call. You never know unless you try! During my year as an official ambassador, I hosted, volunteered and collaborated at several events and felt that my presence in the calendar gave me some more leverage to promote our mission at PFPB. It’s given me a wonderful boost of confidence to know that I’m considered amongst this truly amazing network of women who are making a difference in the lives of dogs all over the country. In 2011 I applied for the 2012 Pinups for Pitbulls, Inc. calendar, I didn’t have a Dog, so I applied with my sisters dog, (which side note I don’t even think she knew) I applied for the calendar model call EVERY YEAR after. Puck came into my life in 2013 and changed it forever, from then I knew I had to do even MORE, I signed up to volunteer at a Pet Expo, my first event was with Deirdre Franklin and Jeffington Bearington, I was nervous( those suckers thought I was quiet), and our booth was across from Shorty Rossi. I was lucky enough to learn from the best right off the bat. I continue to volunteer and I travel all over VA/DC educating and advocating at events because I love what we do, having fun, meeting new people and making long lasting impressions. Yes, it’s exhausting, sometimes stressful, but I’m not doing it for myself, I do it for Puck, Rosie, and all the dogs. I don’t only get these rewarding experiences, I have also gained a huge family that stretches all across America. I waited five years to get that call, “You’re going to be in the 2017 calendar” I only told Deirdre and Jeff to shut up a couple times and I kept my profanity to a minimum. That was also the day they also told me they wanted me to become a Team Lead. It was one of the most exciting days of my life so far. My time with PFPB has been only the best, I urge you to get involved, apply for the calendar no matter your hesitation. Please don’t think you need to be a model with fancy photos, Hell I applied with selfies. If you applied before and wasn’t selected do it again, DON’T GIVE UP, volunteer for that event, sign up for the street team. I PROMISE you, you will not regret it.